This morning, before a person should be awake, I was. 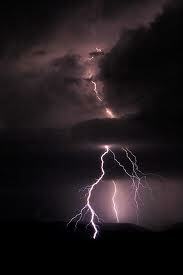 A thunderstorm, complete with lightning and high wind, pounded the house. Out I jumped. Did I close the windows last night? Which way is the storm wind blowing? The full morning light shone somewhere in the world, but not here. What will happen to our eighteen flowerbeds? and the vegetables?Oh, be careful checking the windows. Two of our grandchildren lie fast asleep under the south window. Ouch, the cat litter on the floor reminds me of my bare feet while I rush to check the office window. And it sat closed anyway! The rain barrels overflow. The back one dumping the excess rain right at our toad house. The wind blew right through the house. I could feel it. Oops, the airflow comes from the fans left on for the night after the really hot day yesterday. Do I have to unplug anything? I do unplug my little netbook, but I can’t unplug the old computer because if I do it will never boot up again. Someone said the BIOS battery is dead, but the computer shop says the thing at its age has no value to get fixed, so I don’t know, never will know, and right now I don’t care. But unplug the external drive. Meanwhile the cat thinks I got up for the day and meows for attention. Sorry, Smokey, I got things to do. Later. Ah, come on, “No one knows when that day or hour will come. Even the angels in heaven and the Son don’t know. Only the Father knows…Therefore, be alert, because you don’t know on what day your Lord will return” (Matthew 24:36, 42 God’s Word). What a way for the first lesson of the day, so I’d say, if I may.